• In Kenya, farmers are using Kilimo Salama (Swahili for “safe farming”) to insure against the weather. Already home to the popular M-Pesa mobile money system, Kilimo Salama introduces a new financial application for mobile phone users in Kenya—an example of “direct economic use of ICTs by the poor” in the UNCTAD framework. Whenever a farmer buys agricultural inputs such as seeds or fertilizer, they can choose to also purchase insurance (5% of what they paid for the inputs). Confirmation of the insurance contract is sent by SMS and the mobile is also used to check coverage details and receive compensation. • In Bangladesh, managers of Internet cafes supported by Grameen—the country's largest mobile operator—are generating incomes of $3-4 per day where over half of the population lives on less than $1.25 per day. 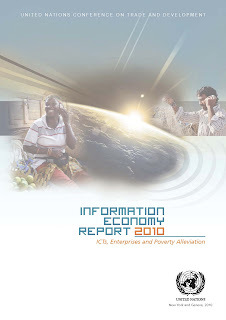 The Community Information Centres use Grameen's high-speed wireless network for their Internet connectivity. 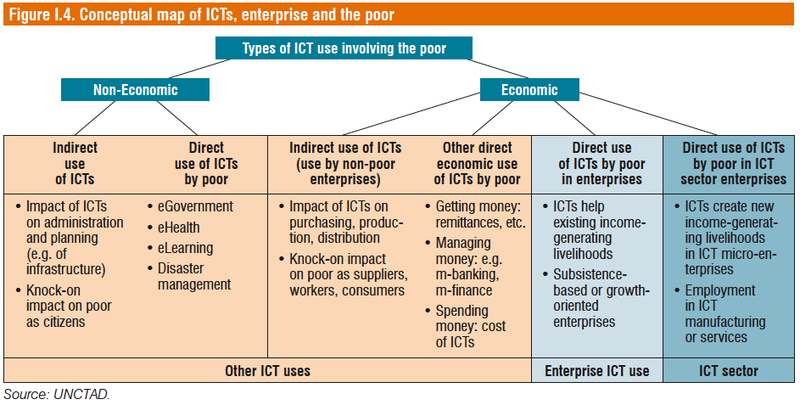 This is an example of “direct use of ICTs by poor in ICT sector enterprises” in the UNCTAD framework. • In southern India, "Fisher Friend" provides a variety of information to those who fish for a livelihood. It uses mobile phones to send weather information, prices and information about where schools of fish have been located. Signals can be reached up to 12 km out to sea. 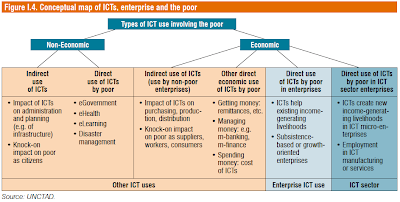 This example illustrates UNCTAD's "Direct use of ICTs by poor in enterprises." UNCTAD. 2010. 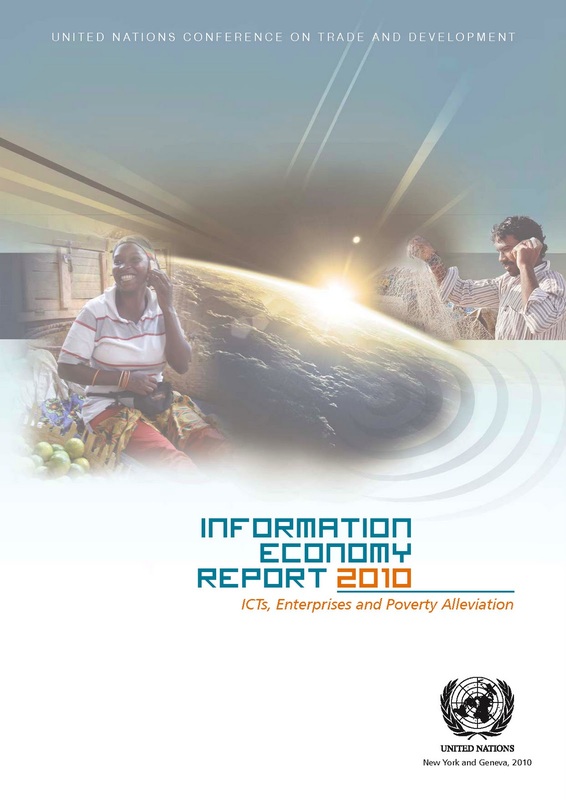 Information Economy Report: ICTs, Enterprises and Poverty Alleviation.